As you can imagine, a kitchen remodel can be perplexing as you may not know where to begin, or how to chart the best course of action. 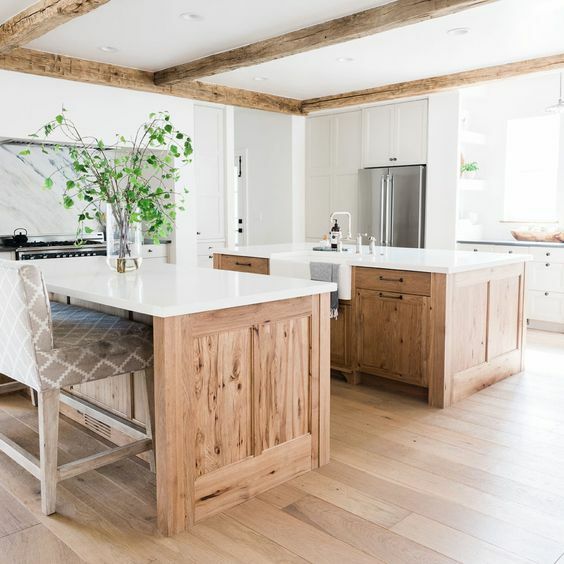 Before you set about planning the initial stages of a complete kitchen renovation, it’s essential to research kitchen styles and trends and create a collection of inspirational photos. This will help you stay on track when it comes time to choose finishes and products. It is easy to get overwhelmed. 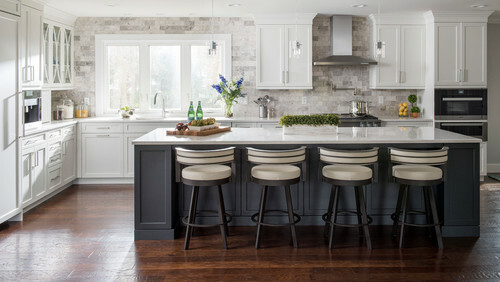 To get you started on bringing your New Years kitchen remodel ideas to life, we’re looking at the top kitchen decor and renovation trends for 2019. Here’s everything you need to know to redesign the heart of your home with confidence and ease. 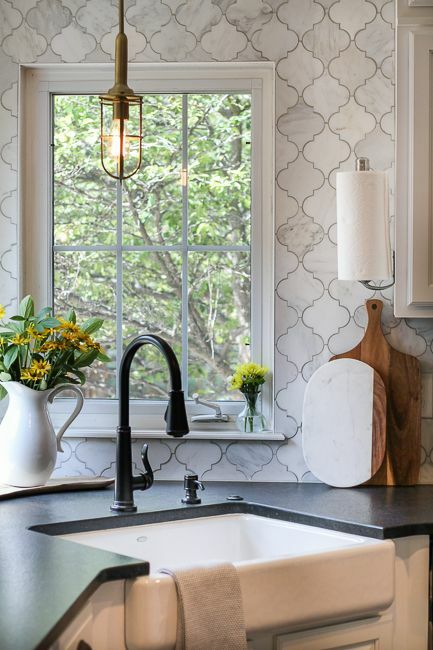 Though we’ve seen our fair share of various countertop materials come and go, the popularity of brilliant quartz finishes continues to have no end in sight as it remains one of our client’s most frequently requested materials, and for good reason. The colors and patterns are very simple and soft. Designer Tip: You can get this look on a budget by opting for a laminate like this one from Wilsonart. The simple countertop colors and patters has a great timeless look, quartz and laminate is virtually indestructible – just be sure to avoid excessive heat as hot spots can damage the material easily. The all white kitchen is out! While there’s no denying the timeless appeal of an ultra-bright white kitchen, but there are plenty of fantastic alternatives to take in for a more rich and intoxicating look. And it should go without saying that all white kitchens are much harder to keep clean on a daily basis, so why not consider bringing in some distinctive hues to create a more memorable kitchen? If you really must have white, consider pairing it with a dramatic feature island or breaking up the cabinets with wood shelving accents. Instead of bright optic white, consider setting a moodier tone in your kitchen with alluring and unexpected color to create a more rich and nuanced look. 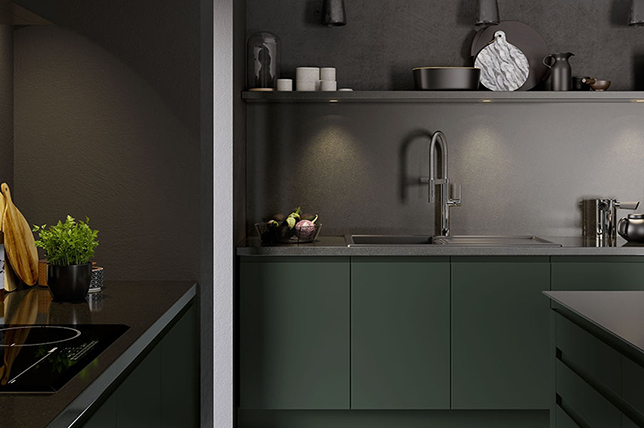 From night watch, 2019’s dark and dramatic green tinged color of the year to earthier terracotta or even more vibrant tones, do consider adding a sense of elevated energy with colors that evoke emotion and a positive spirit. The tendency to go for all-white kitchens is fading. People are looking for something catchy and moodier with their kitchen design ideas. Jewel toned cabinetry add an elegant sense of drama to any home, are easier to manage, and are an elegant alternative to standard ivories. 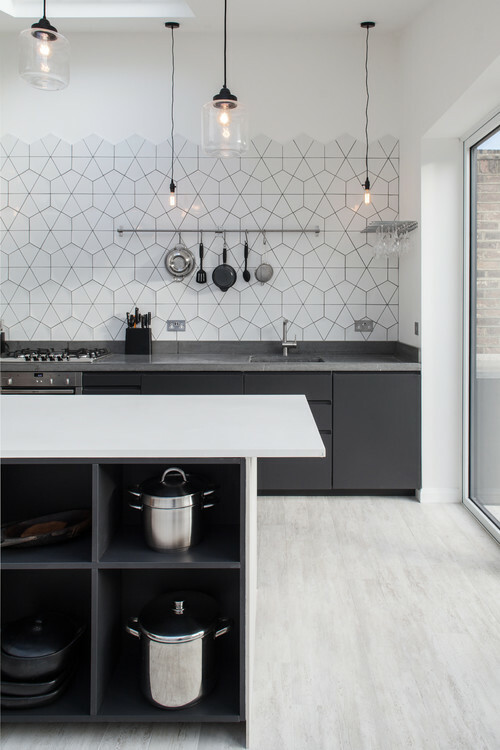 As the times call for clean, symmetrical straight lines, we’re seeing grid motifs used as a lite nod to industrial styling everywhere in contrasting black for windows, doors, and cabinet legs. In 2019 we will see more kitchens and home decor inspired by nature. People are trading in their dark stained cabinets of the early 2000 for more bright and contrasting cabinets. Wood and natural textures soften the space and make it feel comfortable and relaxing.